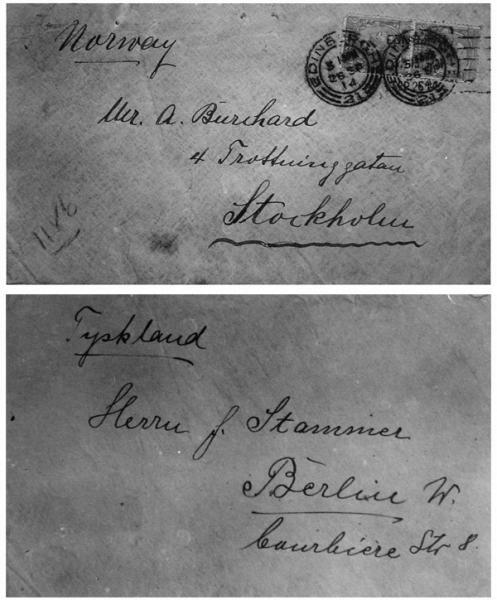 Letter sent by Lody on 14 September 1914. The message reads: "Enclosed cutting from the Edinburgh The News of the World. Typical for the English way of causing ill-feeling and at the same time characteristic of the perfect ignorance of journalists in this country regarding the difference between military weapons and military tools. But this does not make any difference - the people here believe everything. Yours truly, Nazi." 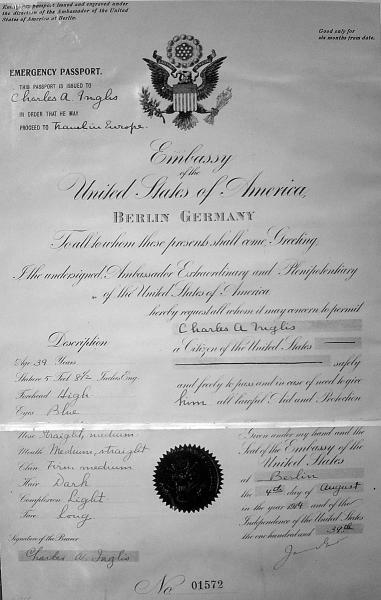 Lody's American passport in the name of "Charles A. Inglis"
Envelopes sent by Lody from Edinburgh, 26 September 1914. 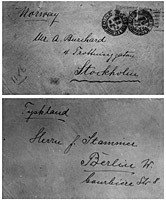 The first envelope was sent to a cover address in Sweden; the second envelope, which enclosed the letter, was concealed inside the first and was addressed to Lody's controllers in Berlin. The documents presented here are the copyright of The National Archives.